Thomas Bach’s election as President of the International Olympic Committee (IOC) was still a few hours away on September 10 in 2013 the last time a successful referendum was held on an Olympic and Paralympic Games bid. The successful Oslo bid collapsed anyway a few months later in a tide of surging political and public opposition, much of which was aimed at the IOC directly. The 2022, 2024 and 2026 Olympic cycles have now produced three failed referendums in Switzerland and others in Munich, Kraków, Hamburg and Innsbruck. Budapest and Boston threw in the towel before a likely ballot, so convinced were they of impending failure. In Sion yesterday, 61 percent of voters in the city itself opposed the bid while 54 percent in the wider Valais canton voted against. Margins of defeat are getting bigger rather than smaller. The only thing more inevitable than an Olympic referendum defeat these days is an IOC response which not only misses the point but appears condescending and out of touch. “From the polls, we understand that outdated information on the cost of the Games was the main concern for those voting against the funding,” an IOC spokesperson reacted yesterday. I have since been told that this reaction was not aiming to criticize voters, and that the IOC realizes that it is its fault if reforms have not been communicated properly. This is not how it came across. The customer or the voter, in this case, is always right. The IOC must, therefore, show some humility and admit more profound changes are required rather than appearing to blame others. Perhaps the voters were not misinformed but were aware enough to understand that, for all the “New Norm” and “Agenda 2020” initiatives, the Olympic Games is still not a financially viable project. Take the Pyeongchang 2018 budget. There was plenty of backslapping last week about the “multi-million dollar” surplus yet no figures have so far been published to back it up. I, for one, am very suspicious about how they went from a deficit to a balanced budget and then a surplus so quickly at a time when so much last-minute tweaking was required. If you include the infrastructural budget and costs borne by provincial and national Governments, the Games cost around $14 billion, marking an increase of about 40 percent on initial forecasts. The IOC likes to claim that you “wouldn’t include the house in the cost of a house party,” but neither could you have a house party without a house. Many new venues, roads, rail-links and hotels were vital for Pyeongchang 2018 and there are still questions about legacy plans and how much the facilities will actually be used. Wind back two years and we still do not yet have a final operating budget for Rio 2016. Until we do so there will be nothing to stop talk of corruption and over-spending surrounding many Games-related contracts. Fast forward two years and you have Tokyo 2020 where, for all the gushing press releases about cost reductions, the budget has still ballooned from initial bid-time estimates. Voters in referendums notice all of these things, even if the IOC hopes they have been forgotten. The “New Norm” may sound impressive but the proposed savings of $1 billion for a Summer Games and $500 million for a Winter one remains small fry in comparison to some increases. Is Olympic financing therefore a lost argument or are there any changes which could make a difference? Yes, the IOC could cover the guarantee for the operating budget. If, as it claims, this budget almost always results in a surplus anyway, then the public relations benefit would surely be worth the risk? 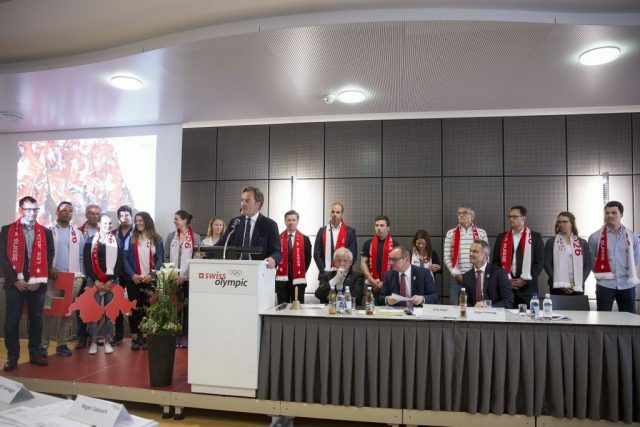 The IOC could also help cover the growing costs of security currently borne by central Governments and have been cited as a key reason for opposition in Switzerland. Other changes could be made to the Host City Contract to reduce the burden from one specific authority. Some observers in Sion reported that the IOC team led by Olympic Games executive director Christophe Dubi worked hard and gave a “credible and human” face to the organization. It also claimed that it was too little too late and the hearts and minds operation should have started years rather than months ago. I am less sure and think a lot more should be made of what the IOC like to – but should not – call the “intangible benefits” of hosting the Olympics. In Los Angeles last year, we heard over and over again how the 1984 Games had inspired people like bid leader Casey Wasserman and city Mayor Eric Garcetti into a love of sport. Paris 2024 did the same and London 2012 before them had huge success with their “Inspire a Generation” rhetoric. The Olympics are still one of the most brilliant, arguably the most brilliant, sporting events out there, and the excitement of London 2012 turned many opponents of the event in favor. The IOC should stop crowing about how they have brought peace through sport and focus on their bread and butter of a sporting rock concert. Should they not have been arguing last week that, yes, the Olympics are not perfect and can be expensive, but the benefits for a country and its citizens can outweigh the risks? It can bring the whole host nation together and provide a boost and distraction from wider woe. There are many valid counter-arguments here about money better being spent on health and services, and I think this argument is easier to make for the Summer, rather than the Winter Games, but it is certainly true to an extent. And what about the volunteers and workers who have the opportunity to gain vital life skills working on an event? Why not send the likes of Usain Bolt or Shaun White to a bidding city as ambassadors? That would stop people talking about money. There are many alternative approaches which could be tried, but the IOC communications strategy is lacking freedom and innovation. Most of the text was taken up with a glowing endorsement from former United Nations Secretary General Ban Ki-moon, who just happens to be the paid chair of the “independent” IOC Ethics Commission. Other bids for the 2026 Winter Olympics and Paralympics are still uncertain. Stockholm and an already chaotic Italian bid are still lacking political support while it is hard to see Graz being successful amid Austrian apathy. Erzurum in Turkey hardly appears viable on security grounds, while Sapporo in Japan would prefer to focus on 2030. A referendum is likely to take place in Calgary, the other contender, around the end of this year and you can rest assured that various “No Olympics” groups will already be flexing their muscle to campaign against. Many local reasons can be cited for Sion’s defeat. The bid was connected to various local political feuds and, yes, there is a social media-driven inclination to vote against big projects. Swiss people are also intrinsically suspicious of the IOC but they also have long memories. Sion was considered the favorite in the 2006 Winter Olympics race, but was beaten by 53 votes to 36 by a weaker Turin bid at the 1999 IOC Session in Seoul. The vote coincided with the Salt Lake City 2002 bribery scandal sparked by Swiss IOC member Marc Hodler, who accused the United States city of using bribery to win its bid, where the defeated cities included Sion. There were suspicions that the IOC members were punishing Switzerland because of Hodler and this has not been forgotten. The stain of corruption does not wipe away easily. Clearly, though, the streak of recent referendum defeats is about more than just local issues. The IOC need to step-up their fight against this now, starting with social media, where I am yet to see one IOC member react to Sion’s defeat. Bach, for some reason, still does not have a Twitter account. The IOC and the International Paralympic Committee, who do not seem to contribute at all to the campaign, despite sharing the benefits, need to tell us why the Games are worth bidding for immediately to counter the other side. If they don’t, they will simply suffer more defeats and this will only provide more opportunities to blame others rather than their own shortcomings.